Before us is the grand creation of a true master. Orlovsky depicts, at first glance, an unremarkable landscape. We see the traditional field for Russia. In the foreground – a grass of green and yellow flowers. On the left you can see tracts of land without grass. They are burned by the sun. If we pay attention to the average plan, we will see small shrubs of rich green color. In the background stands the age-old forest. The viewer feels that the artist loves that corner of nature, which depicts. Impressive special color of this canvas. If in the foreground each leaf and blade of grass is clearly defined, then in the back the trees merge into dark spots of saturated blue and green colors. The picture is dominated by shades of green and brown colors. The artist depicts one of the sunny summer days. White clouds float across the faded sky. We do not see the sun. But at the same time the canvas is filled with them as if from the inside. All of it radiates a special light. The audience creates a truly happy mood. 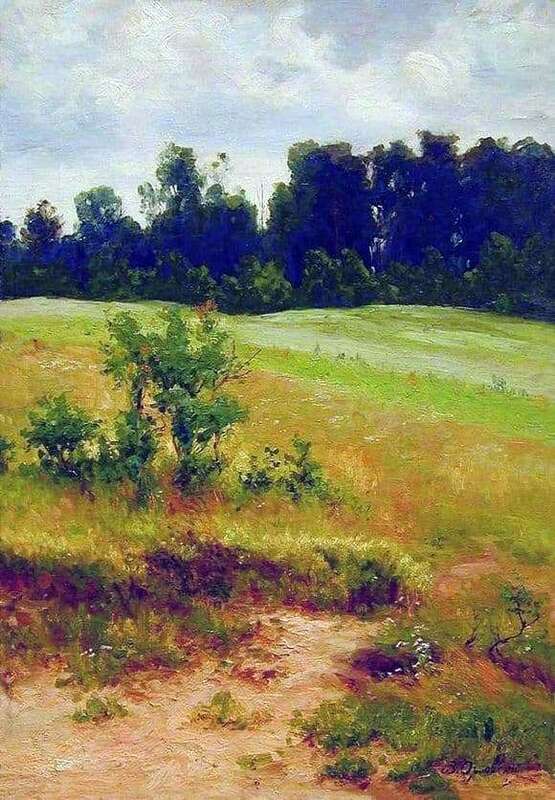 Orlovsky was able to see a special charm in the ordinary landscape. His picture is deliberately fragmentary. It seems that this is part of some great masterpiece. The painter wanted to emphasize the traditionalism of this picture. Impressive breadth of scope and special skill of the artist. His brush works wonders. Orlovsky not only depicts what he saw, but also conveys his attitude to this landscape. We feel that he truly loves this Russian field. It is simple and inconspicuous. But this is precisely where his true charm lies. Only a true master can see this. It is enough to stop and look around to penetrate the secrets of nature. Oryol this managed. He invites viewers to notice this magnificence and to comprehend the special charm of native landscapes. It is so simple.